Experience historic elegance and romance in our bed and breakfast in Coeur d’Alene, ID! Lounge on the fainting couch while enjoying a favorite read. 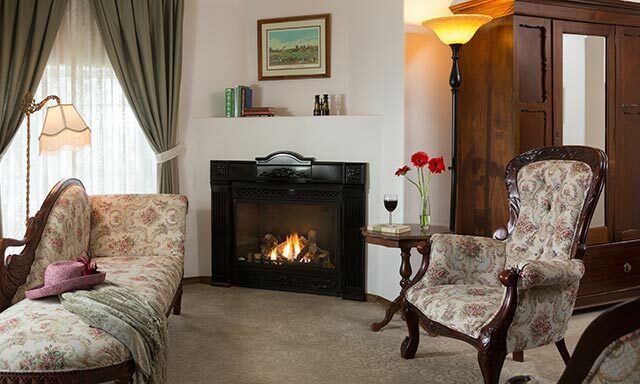 Indulge in a bottle of local wine while cuddling on the loveseat by the fireplace. This large spacious room with King sized bed and pillow top mattress offers a private bath with tub and shower. Three large windows afford a partial lake-view and overlook our finely manicured lawn and garden. 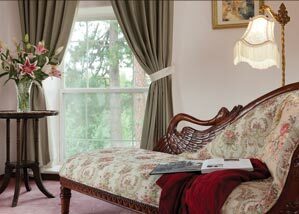 The Roosevelt suite is the perfect choice for any romantic getaway in our historic Coeur d’Alene bed and breakfast inn.